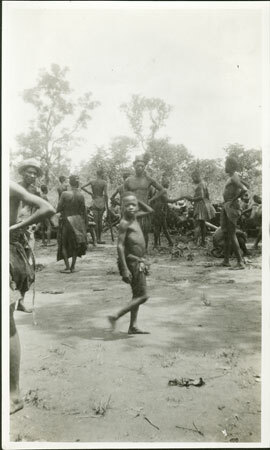 A gathering in a the homestead of Gami (a commoner governor), with people in the background sitting in cane chairs partaking of a feast after dancing. Notes on print/mount - "People at Gami's Rikita's eating after the big dance. IV-1 72/4 EPA745"
Notes on card mount m/s pencil - "SSS upper RHS+LHS & lower RHS&LHS & SSS RHS. ?Fading"
Morton, Chris. "Zande prince's feast " Southern Sudan Project (in development). 03 Jan. 2006. Pitt Rivers Museum. <http://southernsudan.prm.ox.ac.uk/details/1998.341.745.2/>.